Like Samuel Beckett’s even more famous “Waiting for Godot“, Ionesco‘s “The Chairs” (which Beckett greatly admired) combines low comedy with profound philosophical implications and deep tragedy. The author himself described it as a “tragic farce”. This great classic of the Theatre of the Absurd is given a gorgeously successful production in Rob Melrose’s new translation at the Cutting Ball Theater. An elderly couple, over 90 years of age, sit in their isolated home, surrounded by ocean, chatting about expected guests. They are confused and a bit pathetic. The old man begins to cry and call for his Mommy. The old woman repeatedly asks him to retell stories she has heard before, but can’t seem to remember from one day to the next. They are lonely and close to death. They prepare for their guests and begin to gather chairs. The old man is planning a speech, one that will, perhaps, give meaning to his long life. But since he does not speak well, he has hired a professional orator to deliver the speech for him. As the hour approaches, the two become increasingly excited until the doorbell rings, marking the arrival of the first guest. Things get curioser and curioser as more and more guests arrive, all invisible to the audience. The old man plays host, as the old woman rushes about bringing in chair after chair after chair, packing the stage. Magically, the space is soon convincingly peopled with a huge crowd of very specific characters, thanks to the wonderful miming of the two actors. This is theatrical magic of a high order, and provides no end of delight. Jostled by the crowd, moving in and out of conversations, greeting more and more guests, the couple become more and more hysterically frantic. Altogether, it is a tour de force of physical acting that leaves the audience breathless with laughter. The evening progresses faster and faster, producing richer and richer laughter and astonishment in the audience, always with a sense of tragedy underlying the ridiculous. With each new chair, and each new imagined guest, the language develops greater texture and layers of meaning. Artistic director Rob Melrose’s new translation is a revelation of clarity; nuance piles upon nuance in a meteor shower of dazzling linguistic sparkle. Annie Elias’s expert direction engages us fully for the entire 90 minutes, and leaves no doubt whatsoever that we are watching a masterpiece. 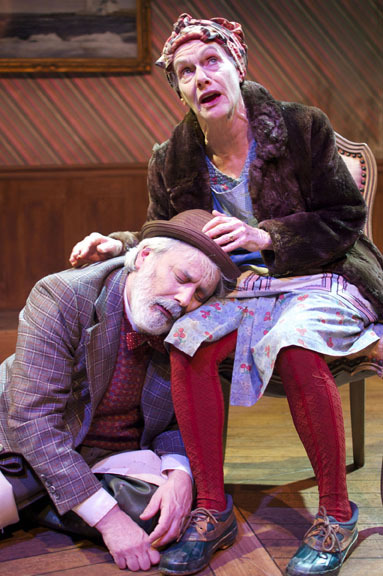 Actors David Sinaiko (the Old Man), Tamar Cohn (the Old Woman) and Derek Fischer (the Orator) are physically astounding, capturing the balance of comedy and pathos that is the distinguishing mark of great clowning. The evocative set by Michael Locher appropriately evokes the feel of a decaying lighthouse. Heather Basarab’s lighting design contributes so perfectly to the overall effect that the play of the light on the walls and the suggestion of the ocean outside functions like a character in itself. Likewise for Theodore J. H. Hulsker’s oceanic soundscape. Sarah Roland’s costumes hit just the right note, most memorably in the case of the Orator. On opening night, the audience experienced a rare phenomenon that is a mark of truly exceptional theatre: at the end of the performance, there was a long extended moment of quiet awe, only then followed by a burst of tumultuous applause. “The Chairs” by Eugene Ionesco, translated by Rob Melrose, produced by Cutting Ball Theater. Director: Annie Elias. Scenic Designer: Michael Locher. Lighting Designer: Heather Basarab. Costume Designer: Sarah Roland. Sound Designer: Theodore J. H. Hulsker. Old Man: David Sinaiko. Old Woman: Tamar Cohn. Orator: Derek Fischer. Posted in Reviews.Tagged Annie Elias, Charles Kruger, Cutting Ball Theater, David Sinaiko, Derek Fischer, Eugene Ionesco, Heather Basarab, Michael Locher, Rob Melrose, San Francisco Theatre Reviews, Sarah Roland, Tamar Cohn, The Chairs, theatrestorm, Theodore J. H. Hulsker.